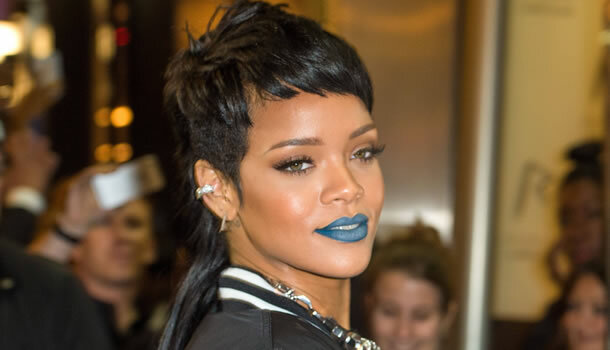 Rihanna is definitely bold so she wasn’t afraid to rock a blue lip at the Rihanna for River Island Fall/Winter 2013 launch. Rihanna’s current makeup artist Lora Arellano is behind this risky look. Lora is part-owner of Melt Cosmetics, a beauty line with a focus on gorgeous matte lipsticks. While there isn’t much information about when Rihanna’s colour will be available you can check Melt Cosmetics for other great lippies. Each will set you back $19. However, if you definitely want to give this look a try Inglot has an entire collection of blue lipsticks. Each lip colour in the Pacific Blue collection costs just $12. Click here to buy and click here to view a swatch of each shade. Illamasqua also has a great option for you. Their new teal matte, Apocolips is available for $26. Get it here.